In fact, this is a window in Villa E.1027, an icon of modern architecture on the Promenade Le Corbusier in Roquebrune-Cap-Martin. It was designed and built from 1926-29 by the Irish architect and furniture designer Eileen Gray. 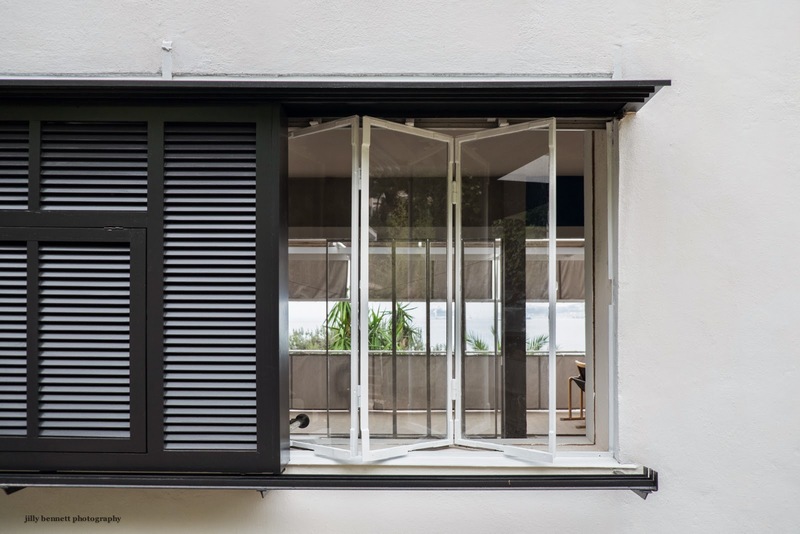 The name of the house, E-1027, is a code of Eileen Gray and Jean Badovici. 'E' standing for Eileen, '10' Jean, '2' Badovici, '7' Gray. The encoded name was Eileen Gray's way of showing their relationship as lovers at the time when it was built. En fait, ceci est une fenêtre de la Villa E.1027, une icône de l'architecture moderne sur la Promenade Le Corbusier à Roquebrune-Cap-Martin. Elle a été conçue et construite de 1926-29 par l'architecte et conceptrice de meubles irlandaise, Eileen Gray. Le nom de la maison, E-1027, est un code d'Eileen Gray et Jean Badovici. 'E' signifiant Eileen, '10' Jean, '2' Badovici, '7' Gray. Le nom codé était la façon d'Eileen Gray pour montrer leur relation amoureuse à l'époque de sa construction. I once saw a documentary on TV about this lady, and I was very impressed about her courage, pure authenticity and avantgarde way of thinking, especially for a woman in those days. If I recall well, she also designed the 'Michelin chair'. What a lady! I wouldn't have known that- very subtle! Interesting photograph leading me to look up her story.